It is appropriate that our Orange pages are dedicated to Qi Gong, Tai Chi Chuan Styles and Daoism, the reason being that Orange is a colour of rebirth and change, growth and vitality. It is believed that wearing the colour orange can balance the emotions when undergoing stressful times. Orange represents endurance and warm, healing energy. Though there are many Tai Chi Chuan styles, the ones you usually see people performing on the beach or in parks are usually the Yang, Chen or Sun styles of Tai Chi. The Wu and Wu/Hao forms are also considered major styles, but are lesser known than the aforementioned. These web pages will be devoted to Tai Chi, its history and practice, as well as its relationship to Qi Gong and Daoist healing methods. Tai Chi is one of the foremost and widely practiced internal forms of martial art, and many people don’t realize that its graceful movements are based on martial arts techniques. Combined with the regular practice of Qi Gong and Daoist health practices, Tai Chi can help one to become strong, flexible and resilient to disease and sickness. If you are thinking of beginning Tai Chi practice, your doctor should be first consulted and his approval given. There are dozens of Tai Chi Chuan styles to choose from if you do decide to begin training in this very beneficial martial art. Whatever the style you choose, the basic principals will be the same. Though different Tai Chi styles may contain different individual movements and sequences, the aim of each is to practice martial arts defence and attack movements, and to strengthen and tone the body while cultivating a smooth and powerful supply of chi (Qi). Cultivating and developing powerful Qi is the major goal of Tai Chi practice, and so it is necessary first to grasp a full understanding of what Qi is. Chi or Qi is what is known in the western world as bio-electricity. The Orientals consider Qi to be the force of nature that fills the entire universe. Traditional Chinese beliefs teach the existence of three major powers – Heaven (Tian), Earth (Di) and Man (Ren). Each of these powers contains its own form of Qi, of which Heavenly Qi is the most abundant, and the most important and powerful. The ancient Chinese believe that the earth’s weather is governed by Qi, and when that Qi is disturbed, major natural weather related disaster such as hurricanes and cyclones occur. Qi is basically an energy field that needs to be kept in balance. When that balance is disturbed, the imbalance causes a cosmic reaction. In the case of the earth’s Qi being upset, physical manifestations such as tidal waves and earthquakes will occur. And so with our own Qi, if its balance is not maintained, that imbalance will manifest itself through disease or emotional and mental disturbances. The practice of different Tai Chi Chuan styles can help us to maintain our balance of Qi. The proper care of our Qi can lead to longevity and good health, and these theories and practice are part of Chinese medicine that extends over two thousand years back in time. The ancient Chinese medical doctors sought to balance the Yin/Yang of the Qi. If you notice the Tai Chi symbol, it is two interlocking crescents within a circle, one black and one white. Yin and Yang represent opposites – hot and cold, good and bad, male and female etc. In Chinese medicine, certain organs are yin based and others yang based, and Tai Chi practice can assist in ensuring that each organ receives its proper amount and type of Qi. We are headed more into the realm of Qi Gong now, which literally translated means “working on our Qi”. We’ll go deeper into the development of Qi power in our discussion of Martial Qi Gong. We all see the people in the parks or on beaches doing slow controlled movements that although elegant, don’t seem like they would do much to promote our health or develop our strength. It all looks very relaxing, but we wonder what the possible benefits could be other than peace of mind. The key to understanding and obtaining the maximum benefits of Tai Chi is to know what is going on beneath the service. The very essence of all Tai Chi Chuan styles lies in the interconnectedness of mind and body. This involves being completely aware of every movement of every muscle and its relation to our internal organs and our flow of Qi. Most Tai Chi Chuan styles have their own set of routines and postures that distinguish it from other schools. There are the 108 postures, the 24 postures, short forms and long forms. Usually beginners will start with a short form, learning first the basic movements, and after discovering how to lead the flow of Qi with the mind. Some styles have two-man forms, where you practice with a partner. This method can be especially effective in learning the martial applications of Tai Chi. Tai Chi Chuan styles all contain elements designed to benefit health, develop martial skills and to learn meditation. All three aspects are interconnected and rely on one another. The physical movements of Tai Chi seek to build a persons strength that they may be able to concentrate better and apply its fighting techniques effectively. The meditational aspects help the practitioner to recognize his Qi, and so direct it in order to withstand penetrating attacks, or to use it to apply exceptional force when attacking. Tai Chi Chuan styles are all “internal” styles, meaning that their power comes from developing it internally through the cultivation and training of Qi. Tai Chi Chuan is borne of a marriage of Daoism and Martial Arts. The name Tai Chi Chuan literally translates to “Supreme Ultimate Fist” and is considered by many to be just that. Tai Chi was at one time considered so effective and deadly that the secrets of its practice were jealously guarded by its developers. These were usually clans or families, and the major forms of Tai Chi Chuan are named after them. The various styles are theoretically in harmony, though the training methods and individual forms of each of the Tai Chi Chuan styles are different. The oldest style of the Tai Chi Chuan styles is that of the Chen family, dating from the early sixteenth century. The Chen family recognize their ninth generation ancestor Chen Wanting as the founder of the family style and the father of modern Tai Chi Chuan. The Chen style has been handed down from generation to generation for over four hundred years, and though different styles have evolved from it, the basic essence of Chen style Tai Chi Chuan remains intact. As with other families, the Chen family did not teach Tai Chi to anyone of a different surname, and it wasn’t until about one hundred and fifty years ago that it was first taught to an outsider – Yang Lu-Chan. Of the major Tai Chi Chuan styles, Chen Tai Chi is known for its use of low stances designed to unleash powerful energy through their uncoiling. It also has a more defined silk reeling practice that sets it apart from other styles. Silk reeling is basically a set of meditative and breathing movements designed to cultivate Qi and martial Jin – an explosive power generated by a combination of coordinating the release of Qi with the movements of various muscle groups. By concentrating one’s breathing and leading the Qi to be released at the appropriate time, a martial artist can manifest powerful and dangerous Jin. This is something many people don’t realize about Tai Chi Chuan styles; they are lethal, powerful martial arts. Many people in modern society view the practice of Tai Chi as being similar to yoga, and there are some similarities, but the essence of Tai Chi Chuan is martial combat, and its movements reflect blocks, strikes and throws. The silk reeling movements of tai Chi emphasize the spiralling of both Qi and muscles to deliver powerful blocks and strikes. It may seem that the movements of Tai Chi Chuan styles are soft, but that is a deception that often leads to the enemy’s demise. Chen style Tai Chi is known for its eight methods system, of practice which employs the basic movements of the style in a flowing form. The eight methods are: Peng (ward-off), Lu (rollback), Ji (push), An (press), Cai (grab), Lieh (Break), Zhou (elbow strike), and Khou (shoulder strike). Chen Style Tai Chi is relatively unknown on the world, but this most dynamic Of Tai Chi Chuan Styles is rapidly becoming the most popular form of Tai Chi in the world today. Tai Chi practitioners of all ages are starting to appreciate the reason that Chen Tai Chi was kept secret for so long. The founder or rather, originator of the Yang style of Tai Chi was Yang Lu-chan. Born in the province of Hopeh, now known by its modern name of Hebei. As with many ancient Chinese personalities, accounts of his early life vary, but one thing for sure is that he developed a love of martial arts. During his early training he learned of the powerful Tai Chi Chuan styles of fighting developed and held secret by the Chen family. Yang ignored talk that no one outside of the Chen family would ever be taught their fighting art and headed off to Hui-hsing in Hunan province where the Chen family resided. As fate would have it, he ended up employed in the household of Chen kai-chou where a famous teacher was employed to teach the young men of the house. That teacher was Chen chang-hsing, and Yang spent his evenings spying on the master as he taught his students. As time passed Yang developed good technique, and Chen happened upon him practicing. Noting that his form was excellent and his desire to learn obviously worthy of being indulged, Chen invited Yang to learn along the Tai Chi Chuan styles of the Chen family along with his other students as a full fledged member of the school - the first non Chen to ever be welcomed into the fold. Yang Lu-chan had three sons, one of whom died very young, and two who became his students. Yang’s sons Yang Pan-hou and Yang Chien-hou were not as dedicated to the art as their father, and upon the death of the master, a prominent student by the name of Chen Hsui-feng took over the school and distanced himself from the two brothers. Fortunately in time the two factions of the Yang school would reconcile. The eldest son of Yang Lu-chan, Yang Pan-hou was a very skilled master of Tai Chi Chuan styles but not a very good teacher. There were few he could work with, and few who could tolerate his crass personality, but he did manage to mentor three adept students. The first Ling Shin left no students of his own, the second taught only one person, but the third extended his lineage a bit further. Wu Quan-yu was the name of the student, and after he became dissatisfied with the Yang style, he developed his own form of Tai Chi, the Wu style of today. Consequently the Yang style died out on Yang Pan-hou’s side of the family. The younger brother Yang Chien-hou carried on his father’s legacy and taught his Tai Chi Chuan styles to his own eldest son Yang Chen-sheng. The second son of Chien-hou died at an early age, but his third son Yang Cheng-fu went on to study under his father and is considered by may to be the father of modern Tai Chi Chuan styles, and credited with introducing the art to the west. The Sun style of Tai Chi is heavily influence by the internal martial arts of Xingjiquan (Hsing-I Chuan) and Baguazhang (Pa Kua Chang). This is due to the founder of Sun Style Tai Chi, Sun Lutang, having been very proficient in these two arts before he began his study of Tai Chi Chuan. Styles are often influenced by each other, and Sun Lutang incorporated some of the theory and practice of Xingji and Bagua into his form of Tai Chi. Sun style Tai Chi is the most modern of the Tai Chi Chuan styles practiced today, having been developed in the early twentieth century by Sun Lutang. Sun Lutang was born the son of a poor farmer in 1861in Hebei, China. His father died at a very young age, and he was forced to work for a wealthy land owner to support his mother and himself. The wealthy landowner took advantage of Sun’s weak physical composition, and only gave him food, no pay. The landowner beat Sun Lutang continuously, but he remained humble for the sake of his mother. Sun Lutang did seek to strengthen himself so that he could better endure the beatings of the landowner and began studying Shaolin Kung Fu under the tutelage of a local instructor. He was eventually dismissed by the landowner after injuring a fellow worker who had tried to beat him. No longer employed, Sun Lutang devoted himself to his martial arts practice and took up the study of Xing Yi with master Li Kui-Yuan, a student of the famous teacher Guo Yun-Shen after being sent to live with a prosperous uncle. Li eventually sent Sun to train with Kuo Yun-Shen, a Hsing-I master of legendary stature. He would study with Kuo for eight years before advancing to study Bagua under the tutelage of Cheng Tinghua, the famous teacher who would be shot by the Germans during the Boxer Rebellion in 1900. Sun Lutang eventually travelled to Beijing where he met practitioners of various Tai Chi Chuan styles, among them a celebrated martial artist by the name of Hao Weichen, one of the originators of the Wu/Hao style of Tai Chi Chuan. The styles that Sun Lutang practiced evolved into the Sun style of Tai Chi, and is a recognized and respected art among practitioners of all Tai Chi Chuan styles today. The founder of Wu style Tai Chi was Master Wu Chuan Yau, a member of the Imperial Guard from Manchuria. He was taught by master Yang Lu-Chan, the founder of Yang style. Master Wu specialized in neutralizing the opponent, and he eventually passed on leadership of the Wu clan to his eldest son Master Wu Chien Chuan. 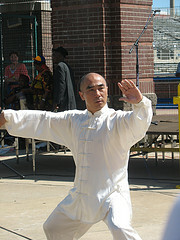 Chien Chuan strongly influenced the development of Wu style Tai Chi, modifying the forms and techniques taught to him by his father. Master Wu Chien Chuan founded a notable martial arts academy with two of his colleagues – Xi-Yiu Seng and Yang Shou Hou. These pioneers made Tai Chi available to the masses for the very first time. Upon moving to Shanghai in 1928, Master Wu Chien Chuan was appointed as a director on the board of the Shanghai Martial Arts association. He then went on to become the overseer to the very prestigious Ching Wu Sports Association. Eventually, in 1935, he opened the first Wu Style Tai Chi School in Shanghai. The next major player in establishing Wu style throughout China and the rest of Asia was Master Wu Kung Yi, a third generation eldest son. In 1954 a Hong Kong newspaper ran an article arguing that Tai Chi was not an effective combat form. Master Yi responded to that argument by accepting a challenge to fight against a martial artist from another style. Thousands flocked to see the great match, and although Master Kung Yi was twenty years older than his opponent (he was 53), he fought to a hotly contested draw, proving that Tai Chi was indeed a formidable martial art. Further development of this lesser known of the Tai Chi Chuan styles can be attributed to Master Wu Kung Cho and his sister Wu Ying Hua. Wu Ying Hua worked tirelessly at the Tai Chi Academy in Shanghai, and after having previously closed, the school re-opened under her guidance in the latter part of the 1970’s. Master Kung Cho wrote and produced the first ever book on the Wu style of Tai Chi, first published in 1935 and again in 1980. Master Wu Tai Kwei continued the work of Master Wu Kung Yi in furthering the popularity of Wu style throughout Asia. Schools were established in Kowloon, Macau, Singapore, the Philippines, Malaysia, and Hong Kong. 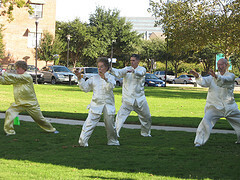 Wu style was eventually introduced to the western world and today there are multitudes of Wu Style Tai Chi Chuan practitioners in North America & Europe, with official schools in Detroit, Hawaii, Ann Arbor, New Jersey, Fredericton, Toronto, and London.